Are you looking for new ways to leverage winter sports athlete endorsers? Are you looking to create an unconventional viral campaign? Over the past year, there was a buzz in the action sports space that Red Bull built a secret half pipe hidden in the mountains of Colorado for Olympian Gold Medalist Shaun White. With no pictures, stories, or first-person accounts, all of the buzz was just speculation... until now. 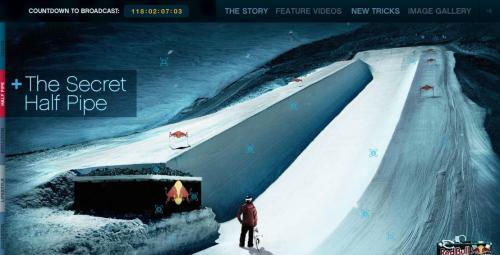 Red Bull recently unveiled the details behind the project - Project X - through an exclusive site (www.redbullprojectx.com) that provides an insightful look into Shaun White's secret winter experience in the world of Red Bull. The site includes a collection of images, videos, and special tricks that White learned while toying with his own half-pipe in Silverton, Colorado. Not only did Red Bull venture out to build the world's first on-mountain snowboarding foam pit, they captured it all on film for consumers to enjoy. The site features a collection of videos detailing the project, etc. and will continue to drive buzz and interest by releasing Shaun White tricks videos throughout the year (beginning November 3rd). Red Bull's Project X further demonstrates how the company is "changing the game" when it comes to investing its marketing dollars. While some brands are investing millions of dollars in signage and presenting sponsorships, Red Bull is radically changing, owning, and creating sports properties and unique concepts of its own. Through the Project X campaign, Red Bull takes athlete partnerships/endorsements to an incredible next level. Both brands (Red Bull, Shaun White) will clearly benefit from the level of intrigue and the "coolness factor" of Project X - something that will help Red Bull score significant exposure leading into the 2010 Winter Olympics in Vancouver.